The LG 23MP68VQ has a lot going for it, it can run at 75hz, it has FreeSync adaptive synchronisation technology built in and it uses an IPS panel to provide fantastic image quality. And at a fantastic price too. 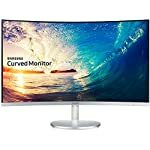 If you are looking for a well priced gamer friendly monitor that can push above 60hz then stop looking. You’ve just found your new monitor. 23″ is on the small side in my opinion but it really is down to personal choice. It’s a common format and many PCs will have a similar sized monitor bundled with them. If you have the space and you are hungry for more space you might want to investigate 24″ or 27″ screens. That said, 23″ are considerably cheaper and this LG gives plenty of value for the price. It might be tempting to think that a monitor on the cheaper end of the scale shouldn’t be good looking but the LG 23MP68VQ proves that this doesn’t have to be true. This monitor has a stylish overall look that will suit any home office with super slim bezels that more premium models can only dream of. The low price means that there are some compromises. The stand isn’t the sturdiest nor particularly adjustable with only a -2°/15° tilt, I would personally miss the height adjustment myself and there is no USB hub. If you have no use for the hub and are happy to place the monitor on a pile of books then it’s a minor sacrifice for an otherwise well balanced monitor. Given this is a fairly recent monitor it is surprising to see that it has both DVI and VGA legacy ports, perhaps this is aimed at people who don’t upgrade often! Thankfully there is an HDMI port for more modern graphics cards. Power is supplied via an external block, fairly typical of screens at this price point. Setup is controlled with a joystick button on the side, thankfully out of the box performance is reportedly decent so that you won’t have too much fiddling around to do. That said, it is worth switching the black mode to low otherwise things look a little on the grey side. Tear and stutter free gaming is available on this monitor assuming you have a FreeSync compatible graphics card, which is any of their models bought in the last couple of years or so. This technology ensures your monitor is syncronised to the output of your graphics card giving you a high quality gaming experience. This is where you see the price advantage of AMD’s FreeSync over Nvidia’s G-Sync technologies, it is possible to include the former whilst still keeping prices low. This is the reason I switched to AMD, even if G-Sync has some advantages. The 75hz refresh rate will also be welcomed by gamers. OK, so it’s not the 144hz and beyond that the premium monitors offer but actually small gains above the standard 60hz are more noticeable. My first LCD screen was capable of 75hz and when I replaced it with a slower screen thinking it wouldn’t matter I honestly regretted it. Higher frame rates do give a better experience. At this price, coupled with FreeSync and IPS this is a neat package. The IPS backed display affords great viewing angles, accurate colours and decent contrast making this a nice all round monitor. 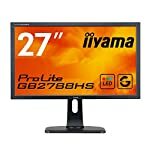 These panels are typically found in more professional graphic work orientated monitors so this would make a good purchase for anyone looking for an all rounder. OK, so it doesn’t compete with the top end and there are a few compromises but in terms of value, the LG is a winner. We give the LG 23MP68VQ a 4.5 out of 5 rating. Want to know what existing owners of the monitor think? You can read real user reviews here. 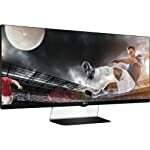 Should I buy the LG 23MP68VQ? 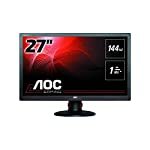 This great looking monitor provides a better than average gaming experience for a great price. Coupled with a high quality IPS panel this screen makes for a very respectable all rounder that provides good bang for buck. If you are having some doubts about this purchase then why not read some real owner reviews and see what other buyers think. Welcome to the LG 23MP68VQ FAQ. This section attempts to answer common questions you may have, please get in touch if you have any more queries or if you think our answers need updating. Can I use it with a Playstation 4? Sure, there is an HDMI port. But only one so this isn’t a good choice if you plan to use it with a PC and PS4. Also, the console can’t make use of FreeSync or the 75hz refresh so those options would be wasted. Yes, it has the smaller 75 x 75 VESA mounting bracket so make sure you have a compatible arm to attach it to.